Combine everything above and allow shrimp to hang out and flavors to merry for at least 30 minutes in the fridge. Then heat skillet and cook for about 2-3 minutes on each side until shrimp are pink and cooked through (not more than 5 minutes). Cover and keep warm until serving. 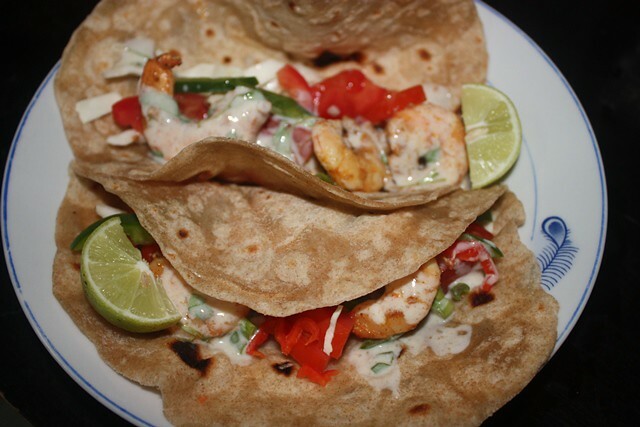 Here we serve them with homemade flour tortillas but I think corn would be better- your preference. And garnish with fresh veggies- sliced avocado, chopped tomatoes, green onions, , green pepper, lettuce (we use cabbage since it is more readily available), hot peppers and drizzle with cilantro lime yogurt. Serve with warm tortillas and fresh limes.....and if you like rice and/or beans. Enjoy with someone you love! i may have to try that with chicken...yummers!! I've done this one a couple of times now and it's really yummy :)Plus we can get all the ingredients here, a definite bonus! !